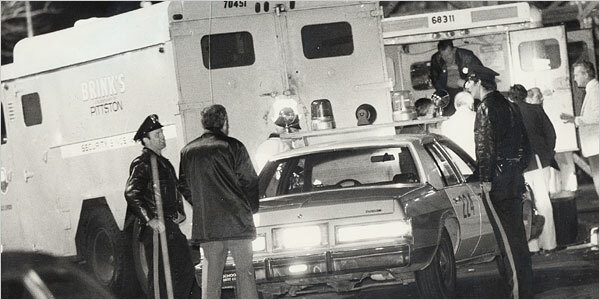 The Black Liberation Army and 19 May Communists were responsible for a robbery that netted $1.6 million from a Brink’s armoured van at a New York shopping centre. Just before 4pm Brink’s security guards Peter Paige and Joe Trombino made their regular collection of money. As they loaded it into the van robbers surrounded them and one fired two shotgun blasts into the van’s bulletproof windscreen, while another murdered Mr Paige and shot Mr Trombino. The criminals took the money and fled the scene. The robbers swapped their vehicle for a U-Haul lorry but were spotted by an eyewitness who telephoned the authorities. All-points bulletins were issued and policemen Edward O’Grady, Waverly Brown, Brian Lennon and Artie Keenan stopped the U-Haul lorry at an entrance ramp to the New York State Thruway off New York State Route 59. The lorry was driven by Kathy Boudin who had dropped her son off with a babysitter prior to participating in the robbery. As she spoke to the police, six heavily armed men jumped from the back of the lorry and opened fire on the police. Officer Brown was shot and, as he lay on the floor, one of the robbers fired several bullets into him. Officer Keenan was shot in the leg and Officer O’Grady died 90 minutes later on a hospital operating table. Officer Lennon was trapped in his car but managed to fire his shotgun at the U-Haul lorry, which crashed into a police car. An off-duty prison warder arrested Boudin. Chris Dobbs, Samuel Brown and Judith Alice Clark were also taken into custody. Thieves Samuel Smith and Sekou Odinga were involved in a shootout with police which left Smith dead and Odinga captured. Three more were captured some months later. The last to be captured was Jeral Wayne Williams (aka Mutulu Shakur) who eluded police until 1986. The first to be tried were Donald Weems (aka Kuwasi Balagoon) and 19 May Communists David Gilbert and Judith Alice Clark amid a heavy police presence. They represented themselves and were given three consecutive 25-year to life sentences. Weems said, “As to the 75 years in prison, I am not really worried because the State simply isn’t going to last 75 or even 50 years.” He died of Aids on 13 December 1986. Boudin was sentenced to 20 years to life. She was paroled in 2003. Samuel Brown was sentenced to 75 years to life. Williams was jailed for 60 years in 1988. In 2008 it was announced that the Nanuet Mall would be demolished. Security guard Joe Trombino recovered from his injuries and returned to work for Brink’s two years later. He was still working for the company when he was killed, aged 68, in the 9/11 terror attacks (search the article). He was waiting in a Brink’s van in the basement of the World Trade Center for three colleagues to return when the building was hit. His three colleagues all survived.